Marsh woundwort is a species with several subspecies. 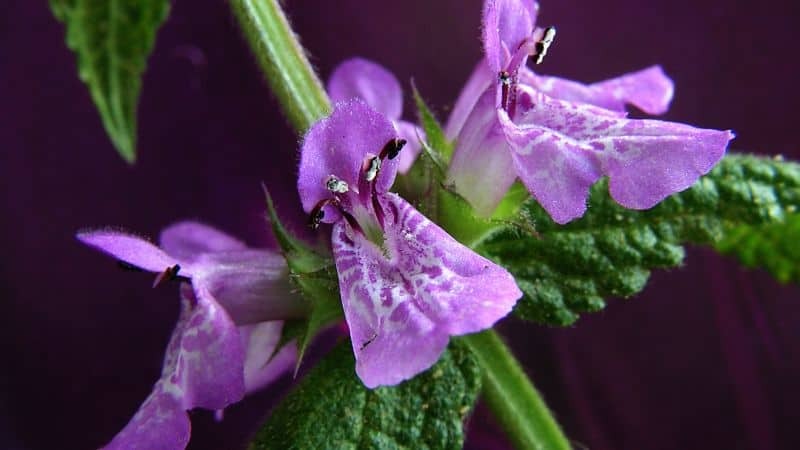 Other Common Names: Woundwort, clown’s woundwort, downy woundwort, hedge nettle, marsh betony, espiga palustre (Spanish), åkersvinerot (Norwegian), Sumpf-Ziest (German), épiaire des marais (French), knölsyska (Swedish), galtetand (Danish). Habitat: Marsh woundwort is native to Europa and Vest-Asia but it has been introduced and become naturalized in North America. The plant prefers moist habitats. It is often found near lakes, banks of ditches and streams, pastures and moist arable land. Due to the plant’s persistent tubers, it can become difficult weed to get rid of. Description: Marsh woundwort is a perennial plant and a member of the mint or deadnettle family (Lamiaceae). It can reach up to 100 cm in height (40 in.). The root-stock is horizontal with tuberous subterraneous runners. The stem is erect, unbranched, hollow and square shaped with opposite pairs of leaves. The light-green, hairy leaves are opposite with short stalks or nearly stalk-less and lacking basal rosette. The flowers are pink-red with a light colored pattern in terminal spikes. White flowers do occur but are very rare. The plant blooms from July to September and is mostly visited by bumblebees. The fruit is a four-parted schizocarp that splits into shiny brown mericarps when mature. The plant has a rather unpleasant smell but not as bad as a closely related species hedge woundwort (Stachys sylvatica). Plant Parts Used: It is the above-ground part of the herb that has been used medicinally. The plant parts are harvested during summer when the plant is about to bloom and then used fresh or dried for later use. As a food and animal feed, it is the small bulbous tubers on the root runners that are used. The runners should be pulled up gently and then used fresh or dried for later use. They have a good, nutty flavor. Active Ingredients and Substances: The herb contains an essential oil, bitter substances (iridoid harpagid and acetyl harpagid), flavonoids, betaine (stachydrine and betonicine) and tannins (rosmarinic acid and other derivative caffeic acids). The root tubers contain inulin and the monosaccharide sugar galactose. Just as the closely related species hedge woundwort (Stachys sylvatica), marsh woundwort was once highly regarded as a remedy for all kinds of wounds, both externally and internally. This traditional use is reflected in the plant’s English common name woundwort. The fresh herb was applied directly on wounds, cuts, and scrapes in order to halt bleeding. 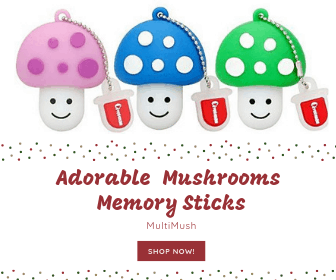 The herb contains an essential oil that has antispasmodic and antiseptic properties. Therefore, it has been used to treat light cramps, arthritis and joint pain. Marsh woundwort has also been used as an herbal remedy for diarrhea and dysentery due to the tannins found in the plant. In many countries, especially in Scandinavia, the root tubers were collected and used for animal feed, particularly for pigs and chickens. This use is reflected in the Norwegian common name “svinerot” meaning “pigroot” and in many other languages, the plant’s common name contains the word “pig” in it. Human consumption of the root tubers was not common and mostly done if other food was scarce for example during a famine. Still, the tubers are highly nutritious with a nice taste and they can easily be used as an addition to soups and casseroles, or dried and ground into flour and mixed with cereal flour. During springtime the young shoots can be collected, cooked and eaten like asparagus. Fully grown plants should not be collected as the stalks taste very bitter. Externally as a healing agent, the fresh herb can be applied as needed. 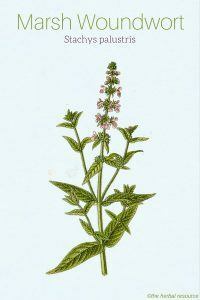 Internally marsh woundwort can be used in the form of herbal tea or tincture. The tea can be prepared by pouring a cup of boiling water over one teaspoon of the dried herb and then simmer for 10-15 minutes. For therapeutic benefits, the tea can be drunk three times daily. As a tincture 1-2 ml, three times a day can be used. 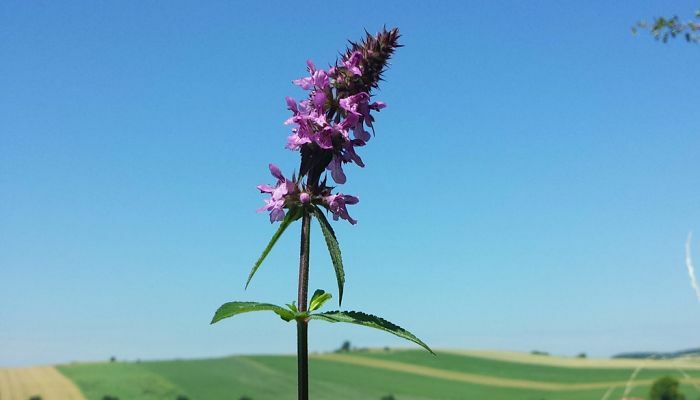 As of yet information on the side effects and contraindications regarding marsh woundwort seems not to be available but the plant is closely related to more known and studied herb wood betony (Stachys officinalis) so the same side effects and warnings might apply. Potterton, David (ed. ): Culpeper’s Colour Herbal. Berkshire, Foulsham 2007.